Unfortunately, a woman’s eggs become more prone to genetic abnormalities as she ages. These abnormalities sometimes lead to increased incidences of infertility, miscarriage and birth defects especially in women over 40 years of age. Egg freezing is a method that suspends egg aging. Since the genetic status of an egg cannot be determined solely on appearance, methods to evaluate eggs using genetic probes have been developed. The egg discards DNA at two different times during its development, ovulation and fertilization. This occurs in order to reduce the number of chromosomes to 23 in order to match the 23 chromosomes delivered by the sperm. The discarded DNA (in the form of excess chromosomes) is jettisoned outside of the egg as a small, round pocket called the polar body. There are several methods available for testing eggs for mutations before fertilization. Removal of the polar body (biopsy) can provide useful information about the genetic status of the egg. For example, if 23 chromosomes are found in the polar body, the presumption is that a normal count of 23 chromosomes remains in the egg. In contrast, if a number other than 23 is found in the polar body, it implies that an abnormal count remains in the egg and suggests that the egg and ensuing embryo will be genetically abnormal. Testing of the polar body using modern genetic techniques such as Comparative Genomic Hybridization (CGH) or Array-CGH, allows identification of abnormal eggs and can thus help determine the number of genetically normal eggs a woman has to freeze. However, there are several important limitations to this technology. First, CGH and Array-CGH are still considered experimental, with minimal clinical data available. Additionally, most clinical data is based on young egg donors and does not reflect the genetic status of eggs from women in their late 30’s or older. 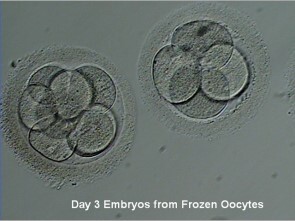 Second, embryos may be genetically abnormal due to mistakes contributed by the egg at the time of the first polar body formation or the second polar body formation; or mistakes contributed by the sperm at the time of fertilization. Therefore, assessing only the first polar body by no means guarantees that a normal embryo will derive. Third, and perhaps most concerning, is the lack of research regarding the effects of biopsying an egg prior to freezing.Several years ago we completed a small clinical trial wherein we performed polar body biopsy on eggs prior to freezing. We found a high degree of egg damage. In addition, many eggs demonstrated abnormal chromosome segregation after fertilization, and none of the patients from this study achieved a pregnancy.This particular study was conducted with the most current and success-yielding method of egg freezing, vitrification. We vitrified the study eggs using a closed container to protect the eggs from viral or fungal contamination. This closed container method, used at the Egg Freezing Center, is currently being tested for FDA approval. Other vitrification methods (open container) expose eggs directly to liquid nitrogen and can lead to contamination. For this reason, the method in use at Egg Freezing Center, and the data presented here is very relevant for patients contemplating fertility preservation and genetic testing. It is my recommendation that women contemplating egg freezing should not undergo genetic testing of their eggs prior to freezing, but rather use these promising technologies to test eggs in the future once they are fertilized as embryos and have all possible egg-derived and sperm-derived abnormalities present for detection.